Categories: Brookhaven Instruments, Particle Characterization. Light Scattering occurs when polarizable particles in a sample are bathed in the oscillating electric field of a beam of light. The varying field induces oscillating dipoles in the particles and these radiate light in all directions. This important and universal phenomena is the basis for explaining why the sky is blue, why fog and emulsions are opaque and other observations. It has been utilized in many areas of science to determine particle size, molecular weight, shape, diffusion coefficients etc. Brookhaven Instruments’ scientists have extensive experience in the development of instruments and methods for light scattering and this experience has been incorporated into the BI-200SM to make it the finest instrument available for research applications of light scattering. The Bl-200SM Research Goniometer System provides access to all of these studies with an automatic,modular and versatile system. 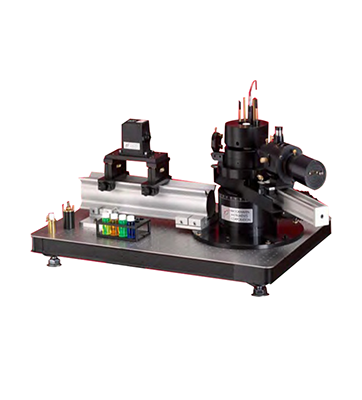 It is a precision instrument designed for exacting scattering measurements. Based on a special turntable with precision ball bearings and stepping motor, the Bl-200SM’s modern design and quality construction guarantee precise measurements due to the wobble-free movement of the detector. It is field proven in hundreds of laboratories. It is ideal for macro-molecular studies and submicron particle sizing. The BI-200SM’s modularity simplifies system expansion. Featuring a standard optical rail, the BI-200SM can be used with neutral density filters, a polarizer, an analyzer, and a reference detector. Special sample requirements can often be met by changing the cell holder design or size.